Formatively assessing student's second language proficiency levels through the use of digital technology tools. Assessment. It is a powerful tool in the education world. Assessments help educators determine if students have met the goals that have been set for them, whether set by the teacher, the state or national content standards. Assessments and their results guide students and teachers alike. They answer the questions “Do my students understand? Are they prepared to move on? Am I effectively teaching the standards? Is there anything that needs to be revisited?” Assessments can be administered in a variety of ways, however the goal is always to check for true student learning and content comprehension. One way to prepare students for summative, high-stakes tests is to incorporate multiple and varied formative assessments throughout the unit. Why not use technology to accomplish this? It will keep students engaged, assess their learning AND better prepare students to work with all types of tools in the 21st century. 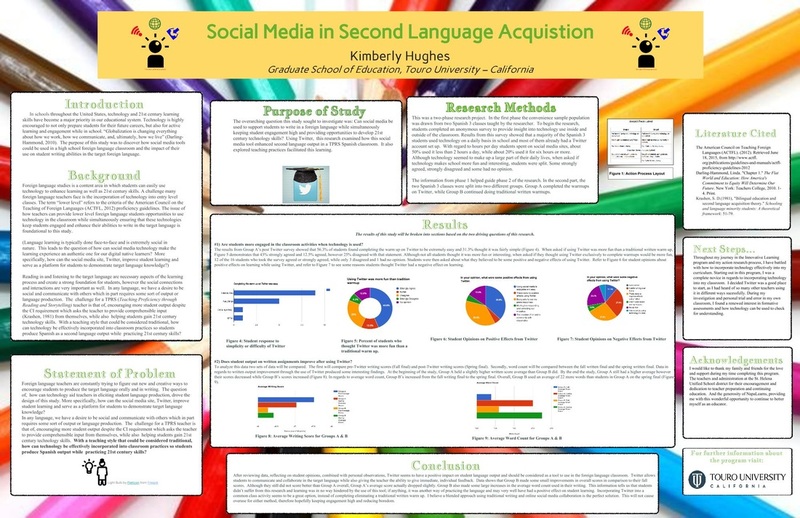 Here you can find my poster displaying my research and findings on social media in the Foreign Language classroom. It was this research that sparked my interest in formative assessments with technology! If you would like to explore the poster more closely, click here to download.